Check out the cover for J.M. 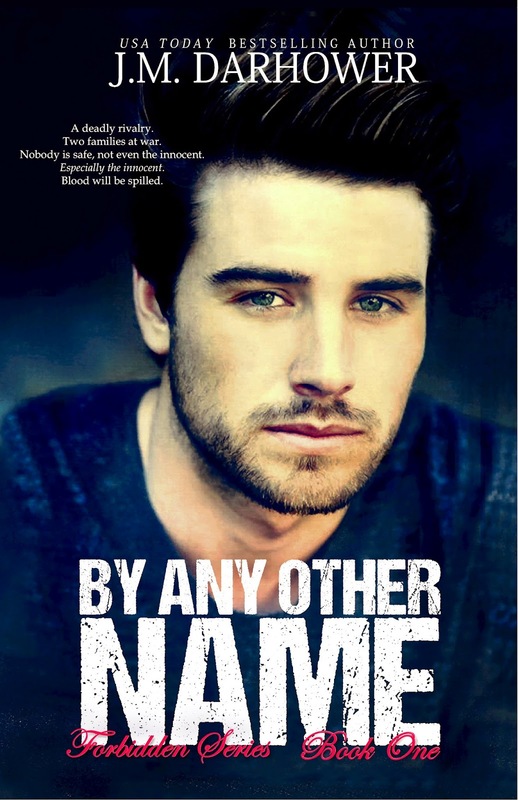 Darhower's new book, By Any Other Name which is due for release on 23rd February. Nobody is safe, not even the innocent. "A Roman Coke," Genna mused. "What's that?" "It's rum and Coke. We just call it a Roman Coke around here." "And because when you get drunk enough, it all just slurs together anyway." "Ah." Genna picked hers up, motioning toward him with it. "So what are we drinking to?" He nodded. "Right now, this moment. Let's drink to it." Smiling, she clinked her glass with his. "Today, then." They threw them back at the same time. The liquor hit Genna's taste buds and she grimaced, the vicious burn seeping down her throat and settling deep in her chest. "Ugh, is there even any Coke in this damn thing?" Matty laughed, setting his empty glass down. "Just a splash." "That's because I prefer it that way," he responded. "Strong and rough, enough to leave a lingering ache. I like it to hurt just a bit." Oh good God. Those words sent a chill down Genna's spine, one she couldn't hide, as Matty waved for the waitress. Eyes never leaving Genna, he ordered another round of drinks. "Another?" she asked, picking up the water to take another sip, this one to soothe the sting in her chest. "You said one drink." A sly smile curved his lips. "I like to keep them coming." "Absolutely." Matty stood, leaning across the table, his lips near her ear. "Maybe you'll let me show you later." J.M. Darhower is a USA Today bestselling author, best known for her Mafia romantic suspense novels. She lives in a tiny town in rural North Carolina, where she churns out more words than will ever see the light of day. She has a deep passion for politics and speaking out against human trafficking, and when she isn't busy writing (or being a fangirl) she's usually ranting about those things.